Dokodemo (anywhere) is a kindred spirit of itsudemo, a companion that frequently appears in similar contexts. The “doko” represents “What place?” and the “demo” represents “regardless,” so it means regardless of location. That is, anywhere. This means, “We can meet anywhere.” It means that there is no special restriction on location. One of the fun little running jokes in the anime version of “Persona 4”, currently airing in Japan, is a “dokodemo demae” (どこでも出前). “Demae” means a catering service, and the kanji are for “out” and “front”. In other words, out of the shop and before your very eyes. At least that seems the broad sense of it. 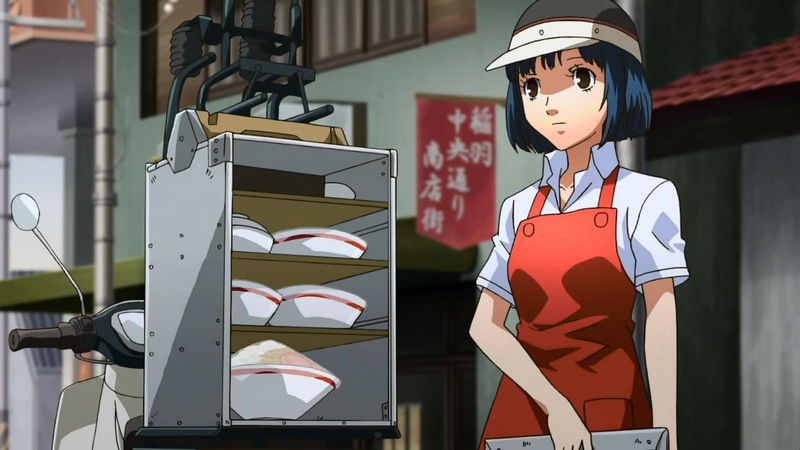 So, the running joke is that the above-shown delivery girl delivers her restaurant’s food anywhere, even the most improbable places, like to a high school classroom (albeit not during actual class). As the section title shows, this means “anytime, anywhere“. This is a pair of words that gets used in two places: a) advertisements, b) sappy romance dramas. After all, a prospective Romeo might say he’ll be there for his Juliet anytime, anywhere. It doesn’t matter where or when, he’ll be there for her. Though, I’d expect to see these words for catering service ads with a lot more frequency. By the same token, well, let’s take VISA credit cards. VISA puts in a lot of effort to establish that they’ll be accepted anytime, anywhere. These broad words form the tone of whatever else is being talked about. I wanted to show these related words with a bit of context precisely because understanding tone and context is very convenient in Japanese. It’s not a matter of “necessity” or “accuracy” so much as it’s just plain nice to keep track of context. If you can understand words like itsuka, itsudemo, dokodemo, and nanika, you’ll be able to focus valuable brain energy on everything else. This entry was posted in Japanese, Languages and tagged anywhere, dokodemo, Japanese, language, learn, nihongo. Bookmark the permalink. I know there’s a “dokodemo door” in Doraemon, but as I know painfully little about Doraemon, I didn’t put it in the actual post. I can imagine what it’s for, though. Just discovered your blog while looking for the meaning of the phrase “望むところだ＂, and I’m loving your site! Your explanations are clear and thorough and does a good job with the nuance. Just a question: can itsudemo, dokodemo also be translated to “whenever, wherever”?